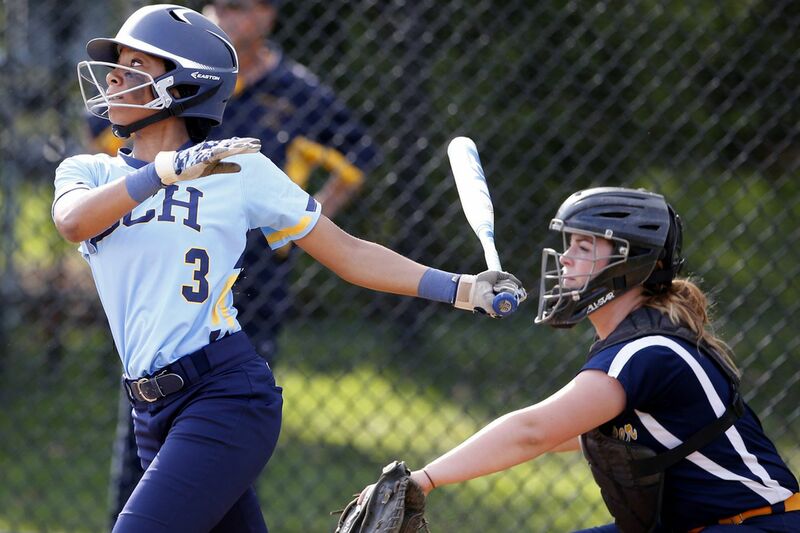 Mo'ne Davis hit a home run for Springside Chestnut Hill Academy against Baldwin on Friday. Sam Klug tossed a no-hitter with just two walks and three strikeouts Friday as the Springside Chestnut Hill softball team defeated Baldwin, 7-0. Katie Reagan doubled twice, and Mo’ne Davis added a home run for the Blue Devils. Maddie Fife recorded her 100th career hit and 100th RBI with a double and a home run in West Chester Rustin’s 6-2 triumph over Chichester. Emily Bassick added a double for the Golden Knights. Emma Boggi homered and Rachael Freas laced two doubles as Bristol cruised past Morrisville, 15-0. Alexa Banner recorded four RBIs Upper Perkiomen’s 17-0 decision over Pottstown. No picture due to the weather but won 17-0 against Pottstown today! PJP again Monday at home. Jack Haveson struck out nine over five innings without allowing an earned run to lead Garnet Valley past Upper Darby, 10-2. Reece Malek smacked two triples and had two RBIs while Nick Wiesendanger went 2-for-3 with three RBIs for the Jaguars. Calvin Costner homered a drove in three runs as Haverford school took down Episcopal Academy, 9-2. Connor Brala doubled twice and also homered for the Fords. Pat Toal earned the win tossing five innings of one-run ball with six strikeouts. Jake Rinehimer, Jon Hannevig, and Ryan Walker each recorded an RBI as Owen J. Roberts topped Methacton, 5-3. Jordan Siket hit two doubles for the Wildcats. Lance Templeton went 3-for-4 with an RBI as Upper Perkiomen downed Pottstown, 12-3. Wayne Stewart pitched five hitless innings with 13 strikeouts to lift West Philadelphia over Dobbins, 8-1. Elias Porter doubled and had three RBIs for the Speedboys. Leon McKnight struck out 13 over five innings as Sankofa Freedom downed Overbrook, 12-2. Jameer Johnson hit an inside-the-park home run for the Warriors. Malachi Pippen went 3-for-4 with a triple and four RBIs as Boys’ Latin rolled past Ben Franklin, 14-1. Sid Navas pitched a complete game with 14 strikeouts as Fels routed Rush, 14-2. Damian Rivera doubled, homered, and drove in four runs for the Panthers. Kyle Campbell and Derek Smith each blasted a home run as New Hope-Solebury beat MaST Charter, 10-1. Michael Lehman added a double and a triple for the victors. Shane McWilliams laced a pair of doubles and Joe Engart tripled in Phila. Academy Charter’s 12-3 win over Prep Charter. Curran McLaughlin tallied a team-high four goals as Germantown Friends edged Academy of New Church, 13-12. Clare Meyer chipped in three goals for the Tigers. @GFSlacrosse hold off strong 2nd half surge by @ANC_Athletics to pull of the 13-12 win! Emily Matson scored nine goals as George School defeated Westtown, 19-12. Alexandra Long added four goals for the Cougars. Jayme Weber recorded five goals as Methacton took down Pottsgrove, 19-8. Sydney Tornetta and Alexa Kratz contributed three goals apiece for the Warriors. Riley McGowan posted six goals in Souderton’s 19-2 victory over Lansdale Catholic. Lauren Scott made six saves in net for the Indians. Becky Browndorf and Mack Moore each scored five goals as Upper Dublin topped Pennridge, 13-6.